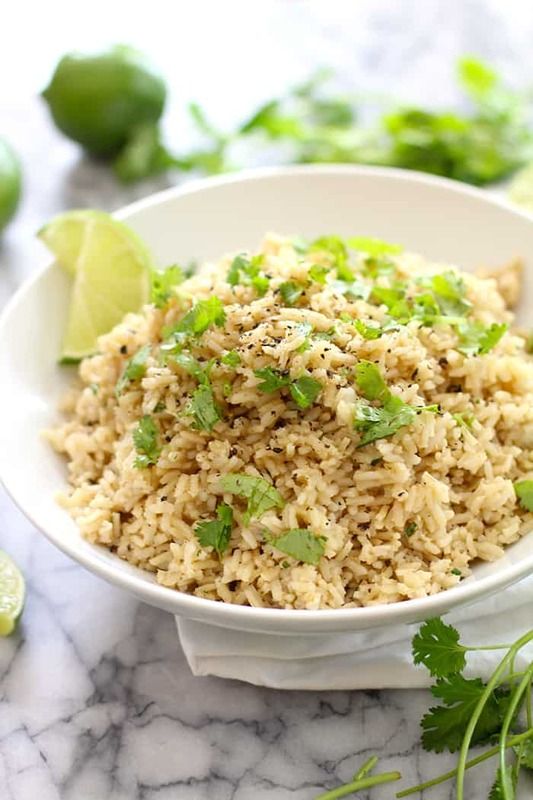 Cilantro Lime Rice is the perfect zesty side dish to any Tex-Mex meal! 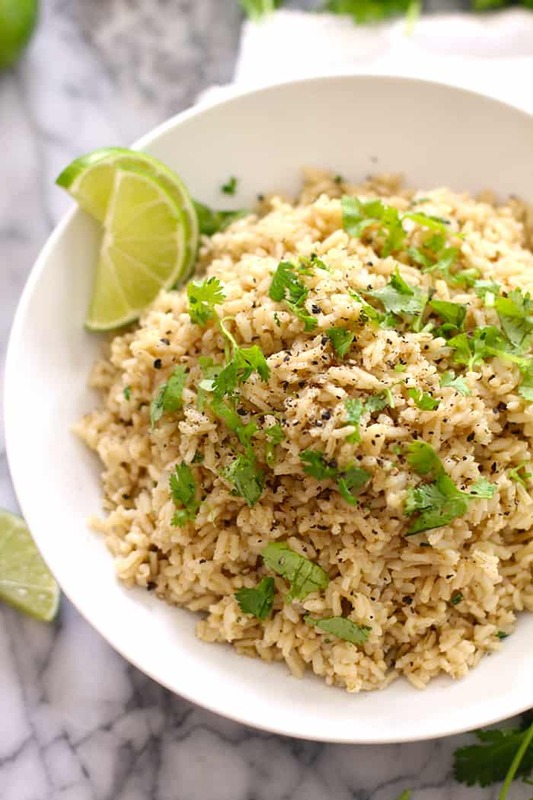 Using long grain brown rice with the addition of onions, garlic, cumin, cilantro, and freshly squeezed lime juice – makes this easy recipe one that you can’t live without. My Tex-Mex extravaganza continues with my Cilantro Lime Rice. Because when you make the perfect Tex-Mex dish, you’ve gotta have a zesty rice to accompany it. Plain white rice simply won’t do, especially when you learn how easy it is to zest it up. Trust me. I whipped this up recently when I made my Shredded Beef Chipotle Enchiladas with Homemade Enchilada Sauce. It’s easy like this. Sauté some onion and garlic. Add brown rice, and sauté for a few minutes. Add water, bouillon cubes, butter, and seasonings. Remove from heat, and add lime juice and cilantro. I don’t know about ya’ll, but I like to keep my pantry stocked with the basics. Brown rice, quinoa, oatmeal, pasta, canned tomatoes and beans, sweet potatoes, yellow potatoes, onions, garlic, broths, and of course, my baking supplies – are just a few staples. When I shop, I always make sure I have an ample supply of fresh limes, lemons, cilantro, parsley, green onions, bell peppers, jalapeño peppers, and various other veggies and fruits. So when I have occasions when I want to make something NOT on my menu plan, I can make it. This Cilantro Lime Rice was a case in point. My oldest son did his own cooking at college this year, and he recently asked me why my rice is so much tastier than his. My quick answer was chicken broth (or bouillon cubes in this case). You have to add ingredients to make it tasty. Onions, garlic, jalapeño…all of these will give it an amazing flavor and you can tailor it to your own family. For more zesty Tex-Mex fare, I’ve created a separate recipe category. Feel free to browse there for a variety of dishes. My current favorites are my Easy Fish Tacos and my Mexican Quinoa Salad with Fresh Corn. My boys love my Beef and Bean Nachos and my other go-to rice recipe, my Spanish Rice with Beans. 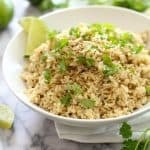 Please let me know if you try this Cilantro Lime Rice, and how you like it! In a medium sauce pan heated to medium heat, add olive oil and onion. Sauté until slightly soft (about 3 minutes), and then add garlic, stirring for another 30 seconds. Add cumin and rice, stirring to brown slightly, approximately two minutes. Add water, bouillon, butter, and salt and pepper. Place lid on pan and simmer until water is fully absorbed and rice is tender. Remove from heat and add cilantro and lime juice. 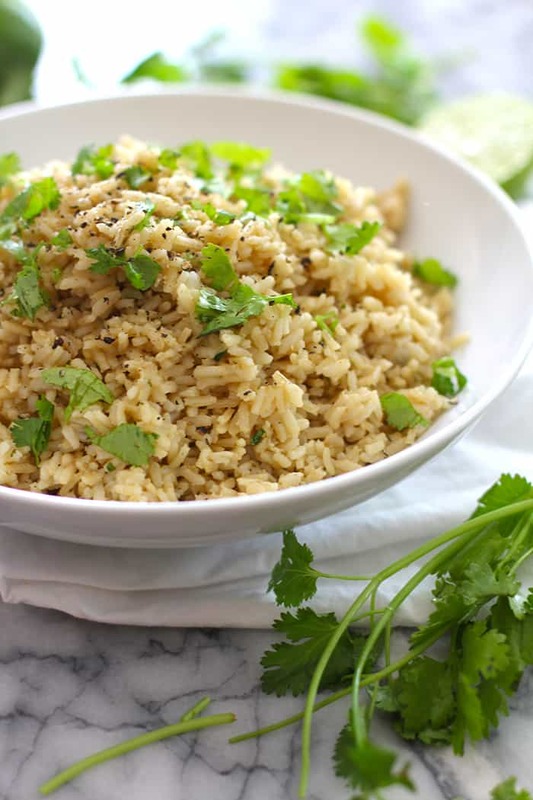 Fluff with a fork, and let rice sit for 10 minutes before serving to absorb the flavors. Top with additional cilantro and freshly ground pepper for serving.